Caterpillar has developed proprietary software technology – Compaction Forecasting Expert Database (CFED) – to predict compaction performance for site specific applications. This report (Phase IV) presents laboratory test results of five soil samples collected from field project sites in Utah, Texas, North Dakota, and Iowa and the corresponding CFED analysis. Recommendations for presentation of in-situ test results and soil mineralogy information in CFED, and a database of volumetric factors for earthwork quantity estimation from literature review are also reported herein. Shrinkage and swell factors of a total of 154 soils were collected from the literature and grouped into seven material groups: (1) rocks, (2) gravels, (2) sands, (4) silts, (5) clays, (6) minerals, and (7) other soils. The swell factors statistics showed a narrow range for gravel soils (minimum value – maximum value = 0.11) compared to other soils (with minimum value – maximum value = 0.22 to 0.44). The shrinkage factors varied more than the swell factors as the shrinkage factor values are likely influenced by the percent compaction achieved in the field. Future research is warranted emphasizing field studies that focus on developing a database of shrinkage/swell factors for various material types and relative compaction. The database should link shrinkage and swell factors to soil classification, gradation, Atterberg limits (for non-granular soils) parameters, equipment, and laboratory compaction measurements. 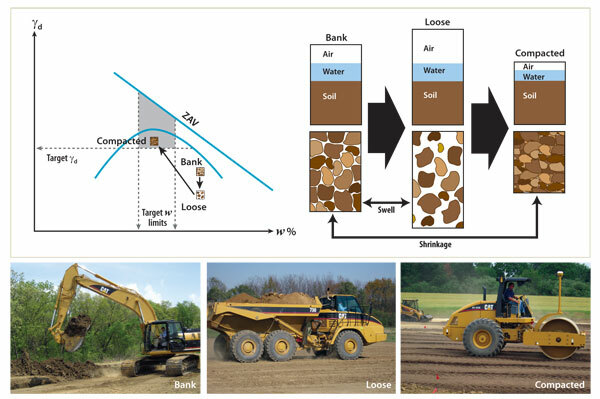 Step-by-step procedures are also described to estimate moisture-conditioning (i.e., wetting or drying) of soil for compaction using bank and compacted soil three phase diagram and weight-volume relationships. These calculations should add value to the contractor’s moisture control and conditioning operations.